Overlooking the Bacino San Marco, this elegant Gothic palazzo was built in the mid 15th-century by the eminent Giustinian family, the same that produced the first patriarch of Venice, San Lorenzo Giustiniani. It was later the Venetian residence of the Milanese condottiere, Giovanni delle Bande Nera. In the 1750 it passed to another great family, the Morosini, then became the Hôtel de l'Europe, where the guest list included Théophile Gautier, William Turner (who stayed on three different occasions) Marcel Proust and Giuseppe Verdi, who stayed here while supervising the productions of his operas at the nearby Teatro la Fenice. 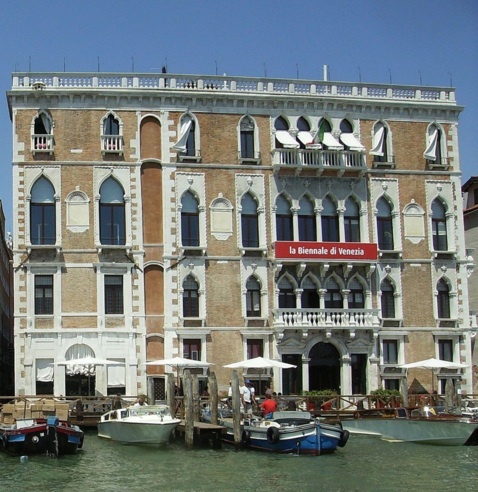 Purchased in the 1930s by the city, with the idea of making it into a casino, the palace instead became the headquarters of the Biennale (Art and Architecture) after the Second World War. The ground floor Portego is used for exhibitions, and the Room of Mirrors is now a café salon, L’ombra del Leone, which often hosts events.